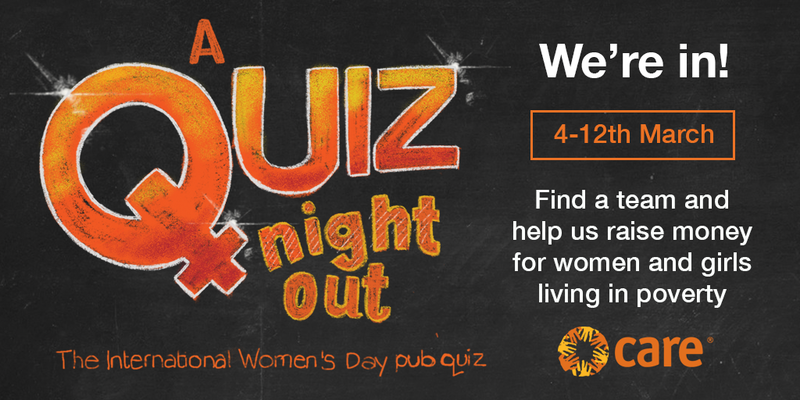 Get your team together for our fantastic International Women’s Day Pub Quiz. 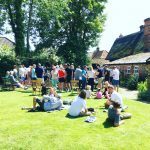 This is a quiz open to EVERYONE – so come and enjoy an evening of interactive questions, great company and ‘professional’ hosts, Al, Tim and Ian to ensure you have an entertaining night out. £5.00 per person. Starts at 7.00. Proceeds going towards raising support for women and girls living in poverty. CARE International UK empowers women and girls to fulfil their potential – because when one woman is helped out of poverty, she brings her family and community with her. 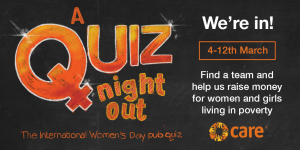 This is not a women only quiz so come along and test your grey matter – all for a good cause (and half time snacks of course! ).